Excellent, efficient and helpful service! I travel often due to business needs, and rarely have time to wait around and get small things done like tailoring. 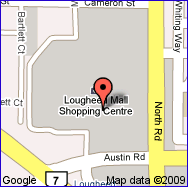 Make It Fit promptly and efficiently tailored my clothing while I shopped at Lougheed mall. The extra service charge for this premium service was well worth the cost, as the value I got was to see the professionalism and skill of Make it Fit. They now handle all my tailoring needs. Keep up the good service and quality work, and I will continue to return every time I am in town and need professional alterations. Wonderful service, excellent tailoring skills – all my alterations are done perfectly, in a timely fashion, at a very reasonable price and I couldn’t be happier. My jeans (x 3) are a perfect fit from the length to the waist size. They look like they were bought off the shelf this way. Thanks for your friendly, professional and happy service. Excellent service, Friendly, efficient and quality work. Very impressed with their skills and service! I held on to a leather jacket for years that didn’t fit me properly and never got worn. I didn’t think anything could be done to make it fit but one of the ladies has a lot of experience working with leather and she did an amazing job! I will definitely go back.